Though not quite as different as chalk and cheese, Gouda and Brie do possess distinct differences. Brie belongs to the class of soft cheeses that are easily spreadable, yet firm enough to hold their own shape without being placed in a tub. Gouda, on the other hand, is grouped with semi-soft cheeses, meaning that it's yielding enough to be sliced and placed on crackers, but won't actually spread across the cracker's surface. The best-quality Brie is imported from France. Imported Brie boasts a mild and creamy flavor and texture, with a musky undertone that saves it from blandness. Brie's soft white rind can either be eaten or peeled off, depending on your preference. You may find Brie offered in "baby" form -- meaning whole but small -- or in larger wheels. The soft cheese is most commonly sold in large wedges, which provide several servings of the rich cheese. Brie's taste is pleasing enough to anchor a cheese tray. For a fancier presentation, however, encase it in puff pastry before baking, or give it a crust of fruit and dried nuts. Slice off the rind or warm it in the oven slightly to make the crust ingredients adhere better to the Brie. For a warm appetizer course, spread Brie over sliced, toasted baguettes, along with such toppings as sun-dried tomatoes and olives, or a fruit-nut spread. From a distance, Gouda wedges look like large apple slices, with their bright red rinds and cream-colored cheese. The red-rind Goudas are delicately-flavored with nutty undertones. The longest-aged Gouda wheels, however, are given a black rind to indicate their pungency. You'll also find smoked versions in many stores. Gouda is imported from the Netherlands, and like Brie, is most commonly sold either in "baby" form or large wedges. Gouda is firm enough to be sliced, grated or cubed in order to add its salty-sweet flavor to a number of meals. 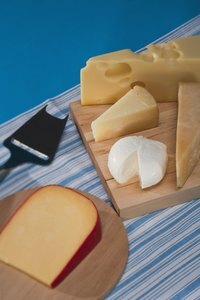 Most dishes that call for cheddar or mozzarella can be perked up with the more complex flavor provided by Gouda. Try the semisoft cheese in baked macaroni and cheese, quesadillas, grilled cheese sandwiches and cheeseburgers. Or include aged Gouda in green salads and cold sandwiches, to add a smokey and pungent depth to these meals.